Tag line: "The weird jungle of cobra plants that feed on women--and rip men apart!" Wealthy industrialist Howard Carlton (Owen Cunningham) wants to build a luxurious resort on a secluded island, but when he sends a survey team to scope out the land, only one of them returns, with the lone survivor, Mitchell (Glenn Dixon), in a permanent trance-like state. So, Carlton does what any sane millionaire in his position would do: hire an investigative journalist named Phillip Knight (Boris Karloff) to lead yet another team to the island. Joined by his assistant, Sarah (Beverly Tyler), and a number of others (including Mitchell, the zombie-like survivor of the first expedition), Knight heads to the island to carry out his investigation, unaware of the incredible dangers that await him. Voodoo Island suffers from a number of problems. First off, the dialogue is only a step above what you’d find in an Ed Wood picture (and a small step at that). Not even the great Karloff could make these lines work, nor, for that matter, could Elijah Cook, Jr., another usually fine actor who plays Martin Schuyler, the nervous proprietor of an island hotel. When Schuyler realizes Knight and his party have brought Mitchell the zombie to his establishment, he grows indignant, saying “This man’s lost his mind. He’s among the dead. He cannot stay. I will not have it”, which he recites with as much emotion as you’d find in a script reading session. Interestingly enough, Adam West makes his big-screen debut in Voodoo Island, playing a radio operator. It’s a small role, but even he gets in on the fun when, after contacting a pilot whose plane is in trouble, he turns to his associate and says, “I hope this guy’s read his bible”. Another issue I had with Voodoo Island was its pace, which can be summed up in one word: yawn. Les Baxter’s musical score tries unsuccessfully to add a little spice to the movie, swelling to a fever pitch in such nerve wracking sequences as “Boarding the Plane”, where the characters board a plane, “The Taking of the Blood Pressure”, during which someone’s blood pressure is taken, and, of course, the very tense “N-5621 Victor Calling Wake Island” scene, where a radio operator repeats this phrase over… and over… and over, until Mitchell the zombie finally stands up, takes a few steps, and collapses (not that I blame him. By this point, I was ready for a nap myself). What’s more, there are parts of the movie that make no sense, like why drag Mitchell along in the first place, seeing as he’s in a perpetually vegetative state? This is one of many questions I asked throughout Voodoo Island, none of which were answered. Karloff and a few of the other actors, notably Rhodes Reason as the hard-drinking ship’s captain, give it their all, but, alas, they were fighting a losing battle. 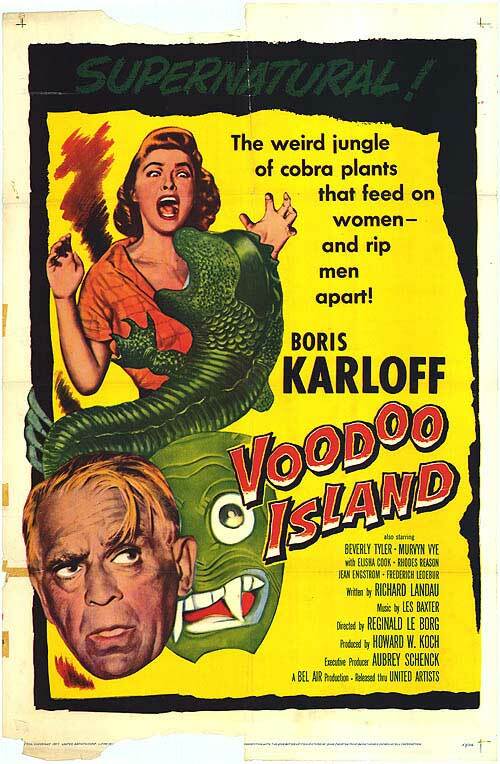 Voodoo Island is boring, confusing, and, at times, just plain ridiculous. Because so many of his films were so poorly regarded in his day, Karloff never got the critical recognition that he deserved. I have yet to see anything more effective than his turn as Cabman Gray in THE BODY SNATCHER. He was brilliant in that role and it's a shame he is not more widely regarded as one of the best film actors of all time.